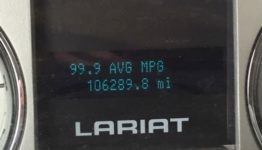 I don’t consider myself a hyper-miler (nor does my 5.4L V8-powered F150 SuperCrew 4×4) so imagine how excited I was when I realized that I was getting a fuel economy of 99.9 mpg! Not bad for a truck that weighs 7700 pounds unloaded! I quickly snapped a picture of my dashboard to prove to any naysayers that I wasn’t making the whole thing up because, after all, the data doesn’t lie, right? Data (or more specifically, the correct interpretation of data) is the key to continuous improvement. You can’t know if you’re doing better if you don’t know where you started from. Or, as a friend of mine says, “You don’t know if you’re winning unless you’re keeping score”. Having spent most of my professional career as an engineer on the shop floor, I’m used to measurements. I’ve measured (and been measured on) $ shipped/day, # of non-conformances realized and cleared, how fast I implemented an engineering change, and sadly also the # of kaizen event I held in a month. All measurements that were developed in an effort to “get better”. As Lean has become more and more prevalent outside of manufacturing, so have measurements. My wife has been a purchasing agent for many years, and one of the “Lean metrics” in her department concerns how many back orders each buyer has. This was developed because (as you may suspect) there were lots of parts on back order and not having them was causing customers pain. So, the management staff got together, figured out what a reasonable level of back orders was (it’s not zero?) and rolled it out to the team. They sugar-coated it with the carrot of a quarterly bonus for the team should they meet the target. While well-intentioned, it’s not Lean to try and solve this problem in this way. It drives the exact behavior that ensued – near the end of every quarter, each buyer grabs their back order queue and clears it out to ensure that they meet their target and all earn their bonuses. Of course while they are doing this, current orders are not being placed, and the cycle ends up repeating itself. As an added bonus (pun intended) just recently they had an extra team celebration for having something like 8 straight quarters of meeting their metric! As we strive to practice Lean and become better at doing so, we tend to also implement more measurements. We do this to gather data, with the belief that the data will then show us where to focus our Lean efforts to deliver more value to our customers. This is true, but we have to pay attention to not only what we measure, but where and how often we do so. Too many times I’ve watched a manager on a Gemba walk glance at charts posted in cells and walk away with an incorrect conclusion about how well )or badly) that cell is operating. Want to demotivate an employee? Ask them to track something they are doing and then don’t do anything with that data to help them be better at it. Every quarter, I encourage my wife to let her backlog fail the litmus test. Then, I argue, you’ll be able to have data to get management’s attention to address the real problem – not having enough people or the right tools to perform your jobs. As it stands, her manager cannot argue to add resources or upgrade systems because, after all, they are meeting their metric and have consistently for years. Obviously, everything is fine! When using data to drive continuous improvement, make sure you’re measuring the right thing, at the right time, in the right way. Don’t make charts that mean nothing and add no value to operating the organization. Make it meaningful; make it work and if it doesn’t, change it. Use data to help employees make their jobs easier and more efficient, which in turn will engage the workforce and deliver more value to your customer. That’s what Lean is all about! ← Do you really need a spare tire?